« Summer safety tips from MVMA! 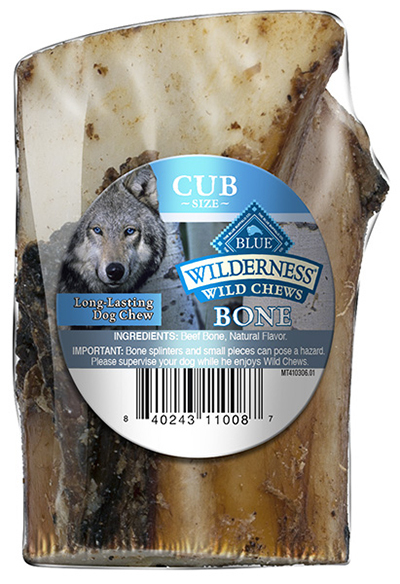 Blue Buffalo Company is voluntarily recalling one production lot of Cub Size Wilderness Wild Chews Bones. This is being done in an abundance of caution, as the product has the potential to be contaminated with Salmonella. Healthy people infected with Salmonella should monitor themselves for some or all of the following symptoms: nausea, vomiting, diarrhea or bloody diarrhea, abdominal cramping and fever. Rarely, Salmonella can result in more serious ailments including arterial infections, endocarditis, arthritis, muscle pain, eye irritation and urinary tract symptoms. Consumers exhibiting these signs after having contact with this product should contact their healthcare provider. Pets with Salmonella infections may have decreased appetite, fever and abdominal pain. Other clinical signs may include lethargy, diarrhea or bloody diarrhea, and vomiting. Infected but otherwise healthy pets can be carriers and infect other animals or humans. If your pet has consumed the recalled product and has these symptoms, please contact your veterinarian. The product was distributed starting November 19, 2015 in PetSmart stores located in the following 9 states: California, Kansas, Michigan, Minnesota, Montana, Nevada, Oregon, Utah, and Washington. The recalled product comes individually shrink-wrapped in plastic with the UPC number 840243110087 printed on a sticker affixed to the product, and an expiration date of November 4, 2017, printed as “exp 110417” on the shrink-wrap. Consumers should look at the UPC Code and expiration date on the product package to determine if it is subject to the voluntary recall. Routine testing at the manufacturing site revealed the presence of Salmonella in the product. No illnesses have been reported to date and no other Blue Buffalo products are affected. Consumers with questions may contact Blue Buffalo at: 888-641-9736 from 8 AM to 5 PM Eastern Time Monday through Friday and the weekend of November 28, 2015, or by email at Bluebuffalo4260@stericycle.com for more information. Blue Buffalo, based in Wilton, CT, is a pet products company that makes natural foods and treats for dogs and cats.